Alexei Emelin signed a three-year deal in the KHL last month, but the veteran defender claims he had the option to stay in the NHL. Emelin told Igor Eronko of Russia's Sport-Express on Friday that he had offers from three or four NHL clubs, but turned them down because they were all offering one-year contracts. Emelin said specifically that the Washington Capitals were among the teams to offer him a contract before he signed with Avangard. 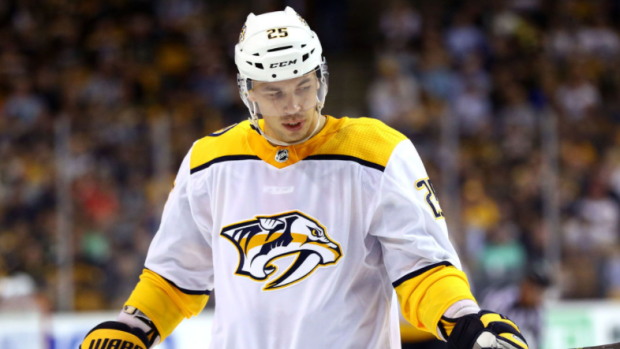 The 32-year-old spent last season with the Nashville Predators, scoring one goal with eight assists over 76 games. He also appeared in 10 playoff games. Prior to the Predators, Emelin spent the first six years of his career with the Montreal Canadiens, scoring 14 goals and 58 assists over 380 games. The Russian also had one goal and four assists over 29 playoff contests. The Habs selected Emelin in the third round of the 2004 NHL Entry Draft. Emelin has three assists and a minus-7 rating in 14 KHL contests this season.